None of them are amazing. But here are the best. With Captain America: The Winter Soldier tearing it up a the box office and The Amazing Spider-Man 2 tearing up it being very mediocre, ReelGood thought there was no better time than now to look back and rank the top ten Marvel Movies. Since ReelGood enjoys inclusion, this list will not be limited to the films that are fully under Marvel’s control, which means we’ve got a bit of X-Men and Spider-Man action in there to keep the punters happy. The first Captain America film has never fully gotten the recognition it deserves. It’s perhaps the most ambitious of all the Marvel films, being almost entirely set during the Second World War. It also manages to take a largely antiquated character and somehow make him relevant for modern audiences. 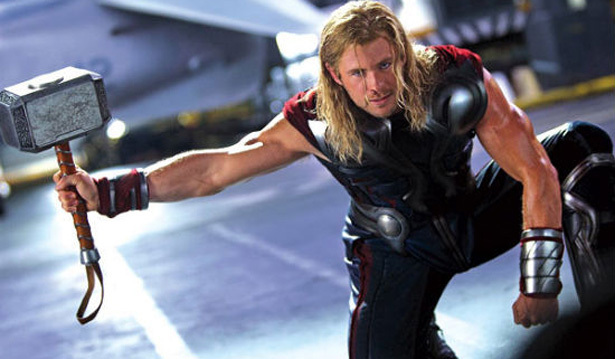 Thor is successful in no small part thanks to Chris Hemsworth’s awesome performance as Chris Hemsworth with long hair and a beard. If there is another actor that could have played Thor better, ReelGood doesn’t want to hear about it. Oh Hemsworth, my Hemsworth. There’s a special circle in hell reserved for X-Men Origins: Wolverine, but James Mangold’s follow-up The Wolverine is surprisingly entertaining. The action-stuffed last half an hour lets down what is for the most part a very compelling film about Wolverine pretending he’s a samurai. The film that started Marvel on the road to The Avengers and reinvigorated Bobbert Downey Jr.’s career, Iron Man remains for many the finest of the Marvel films. For ReelGood, it remains the seventh finest of the Marvel films. There was a lot that really sucked about Shane Black’s Iron Man 3, but ReelGood really liked the scene where they all fall out of a plane and Tony Stark saves them all. We also didn’t mind the little kid. The Mandarin sucked. There’s certainly nothing bad about Wesley Snipes playing Blade and there’s also nothing bad about Guillermo Del Toro deciding to direct a Blade film. Blade 2 did all the things that the original got right, but luckily decided to get rid of scenes in which vampires used sunblock to walk about in the daytime. Bryan Singer is returning to the X-Men franchise this year after over a decade-long hiatus from the series with X-Men: Days of Future Past. Singer’s X2 is still by far the best entry into the series, and set up a whole lot of stuff really well that Brett Ratner would later squander in X-Men: The Last Stand. The new Spider-Man film is fairly boring. Spider-Man 2 was pretty awesome. There was only one villain, something superhero films often forget is a good idea, and all the setting up was already out of the way, meaning director Sam Raimi could get right down to it. Dr. Octopus is still one of the best Marvel villains to date. Thought the big fella was going to be number one, did we? It’s hard to go past The Avengers when compiling a list of the best Marvel films. It certainly wasn’t perfect, but there’s something inherently exciting about seeing The Hulk, Thor, Iron Man and Captain America on all screen together. Oh, and Black Widow and Hawkeye too…..
Captain America 2 was so great because there were consequences. We didn’t know who would make it out alive and what the repercussions of the events would be. The action was brilliantly staged and the first two third of the film felt like an espionage film from the 1970s. This is the one to beat, folks.